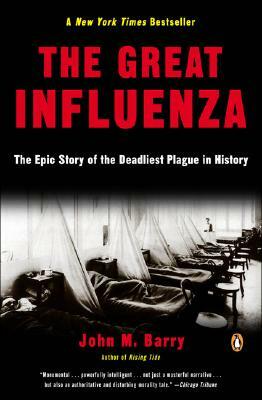 In the winter of 1918, at the height of WWI, history's most lethal influenza virus erupted in an army camp in Kansas, moved east with American troops, then exploded, killing as many as 100 million people worldwide. It killed more people in twenty-four weeks than AIDS has killed in twenty-four years, more in a year than the Black Death killed in a century. But this was not the Middle Ages, and 1918 marked the first collision of science and epidemic disease. Magisterial in its breadth of perspective and depth of research, John M. Barry weaves together multiple narratives, with characters ranging from William Welch (founder of Johns Hopkins Medical School) to John D. Rockefeller and Woodrow Wilson. Ultimately a tale of triumph amid tragedy, this crisis provides a precise and sobering model for our world as we confront AIDS, bioterrorism, and other, as yet unknown, diseases.